Join thousands of fellow runners at one of the nation’s premier half marathon road race events, the Chicago Half Marathon & Life Time 5K that takes place each September here in what’s famously known as the Windy City. More than 8,500 runners crossed the finish line at the race’s 2013 running, including more than 7,800 runners in the half marathon alone. Named by Runner’s World as one of the top 10 half marathons in the United States a few years back, the race takes you along Chicago’s famed Lake Shore Drive for more than half of the 13.1 miles of the course, offering up breathtaking, scenic views of the city’s lakefront parks and downtown skyscrapers. The out-and-back course starts and finishes at Jackson Park, next to the Museum of Science and Industry inside the park, and follows its first couple of miles on a run around the perimeter of the park, along Cornell Avenue, Stony Island Drive and Marquette Drive. After taking runners around the southern end of the park, the course then turns northward for the next stretch of the race, which unfolds entirely along Lake Shore Drive toward Burnham Park. Once runners make it the three miles to Burnham Park, they reach the turnaround and begin the final three-mile stretch of the race back to the finish line at Jackson Park. As you might expect, the race is run entirely on paved surfaces throughout the city streets of Chicago, which provides a very runner- and spectator-friendly environment for the race. Friends and family to see runners at the start, at mile 3, near the front of the museum near mile 4 and along Lake Shore Drive and by the east side of the museum near the 57th Street beach. Due to the busy nature of Lake Shore Drive — the street is home to several churches, parks, lake harbors and a golf course — race organizers ask that participants keep at least a 13-minute-per-mile pace, and finish in just under three hours (which means runners only, no walkers). Weather conditions in Chicago in the early fall are beginning their steady cooldown towards the city’s famously frigid winter season, but are still mild to moderately warm in mid-September, which has brought record temperatures here as low as 37°F (in 1974) and as high as 99°F (in 1953). On race day (Sept. 22), the average low is 55°F and the average high is 74°F. See the Chicago Half Marathon course map here. 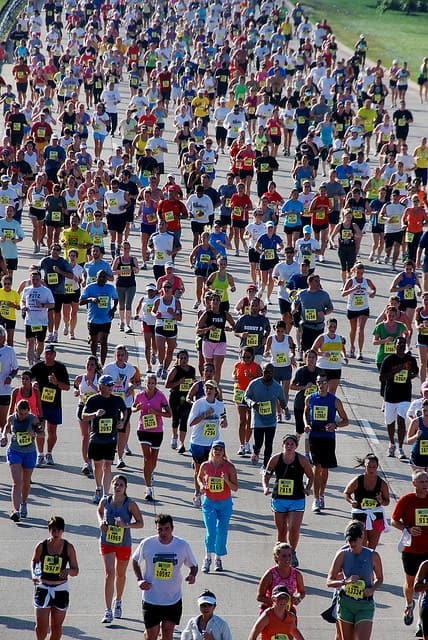 To reserve your spot in the 2019 running of the Chicago Half Marathon or Life Time 5K race, register online at Chronotrack.com here. Ever run in the Chicago Half Marathon? Share your impressions here, or post your review in the Comments box below. Looking at the official race website, I’m not seeing any information specifically about walkers and walking the event. They do say they have a pace requirements — 16 minutes per mile or faster. They have a Sag Wagon and “Back of the Pack” crew that will pick up runners who can’t keep up this pace, due to the need to re-open roads later. I would love to vacation in Chicago this year and maybe do this half marathon. Any tourist coupons to help me.